A remarkable and comprehensive guide for entrepreneurs…a blueprint for business and financial success. If you had the opportunity to work where, when, and with whom you wanted-all while getting paid very well-would you take it? 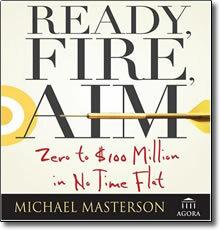 Self-made multimillionaire and bestselling author Michael Masterson did, and with Ready, Fire, Aim he’ll show you how to do the same. Duplicate your winning strategy in several businesses so you never have to worry about “needing” any one of them. Over the course of his remarkably successful career, Masterson has developed dozens of businesses, including one still growing at $300 million. Now he shows you how to outsell your competitors; implementing innovative operational procedures to reduce costs and use the power of the Internet to reduce customer complaints and increase profits.